Another year has gone by and it's January, the month for the west coast's edition of the Fancy Food Show. Put on by the Specialty Food Association, the FFS takes over Moscone Center in San Francisco for three days. Purveyors from around the world come to show their newest and best products, hoping for new grocery, restaurant, and catering customers. 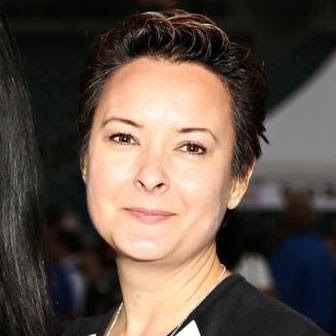 Each year a panel of judges determine the top five food trends from the FFS. This year's list included: Sriracha in everything, crunchy snacks, low sugar drinks, fancy condiments, and mint everywhere. The biggest, obvious, trend for me was ridiculous amounts of flavored popcorn, followed by the Sriracha flood. But I also look out for things that peak my own interest that I, as a home consumer, would be interested in - especially if they are healthy. As I filled myself with a diet of cheese, charcuterie, and chocolate, I did find a few things. I'm hopefully going to receive some samples so I can write more about some of them in the future, but here's what I especially liked. There's been some debate lately about the fact that Coca-Cola, through it's Dasani brand, is marketing drink drops to flavor water. Should water, healthy and free, be replaced with water with additives? Certainly not, but as a person who grew up finding water to be boring and not tasting good (because I grew up overseas), I am the perfect customer for water flavoring drops. The key is to pick good ones, or, at least, better ones. 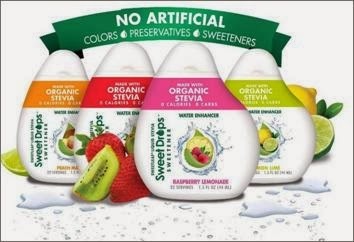 Instead of one with artificial flavors and colors like those produced by Dasani and Aquafina, I'd rather have SweetLeaf's version with natural, organic stevia. Plus, there are no artificial colors, additives, or sweeteners. I was given a sample of their strawberry lemonade flavor, which I really like. It takes fewer drops than those other brands to flavor your glass of water or, as I use it, in sparkling water. Speaking of adding healthier things to your water, Blue Monkey has a great one. Coconut water powder. 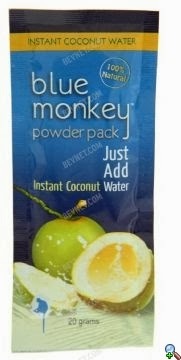 Mix a packet of this into a bottle of water and turn it into coconut water. It is spray dried, dehydrated coconut water, with a bit of natural sugar, re- added to replace the sugar lost during the dehydration process. During World War II coconut water would be used intravenously when blood was in short supply because coconut water has the electrolyte equivalents to human blood. So it really is one of the healthiest things you can drink, especially after a workout. When I got the pre-show email for this product I knew I needed to check them out. Melt is a line of spreads made with healthy coconut and flaxseed oils. They were even on Doctor Oz (at 3 minute mark) talking about helping to deal with one's desire for fats. I was most impressed with their Rich & Creamy MELT Organic, which cooks, bakes and melts just like butter, but with half the saturated fat and fewer calories. The secret, I was told, was that they add just a bit of ghee, or clarified butter, to give it the butter flavor that we love. They also have a honey and chocolate version. Imagine spreading these on toast instead of Nutella - much healthier. Another set of spreads that impressed me were the seed butters from Superbutter. Instead of peanut and almond butters, these butters are just as tasty, but made with sunflower, flax, and sesame seeds. 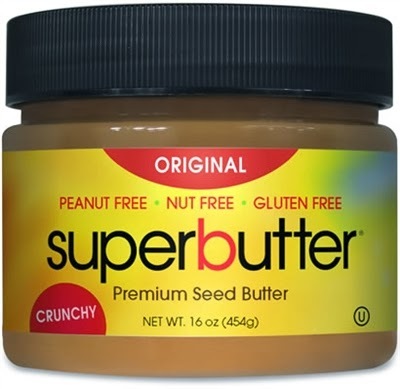 They are high in protein and antioxidants while being lower in fat than nut butters. These are a great alternative for those with nut allergies and can be used in recipes just like you would use peanut butter. Honestly, they tasted just as good, if not better. I first saw these in the Whole Foods dairy case and they caught my eye because I love chia seeds. 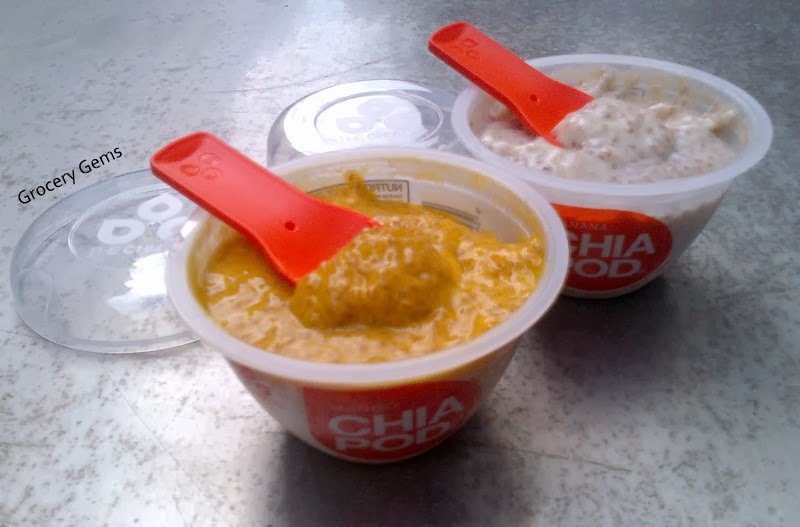 If you like rice pudding but can't do dairy, you will want to try these. They use coconut milk, with all its health benefits, to boost the great benefits of the chia seeds. Chia is not only high in protein, but also Omega 3. Chia is super high in soluble fiber which, in addition to filling you up, has cholesterol-lowering properties and prevents the absorption of fat. At my day job we often have bao sales for fundraisers. Baos are those baked Chinese buns filled with barbecue pork, chicken, or other fillings. Now someone took that idea and turned them into frozen sandwiches. If you don't have a bao bakery or sale near you, you might want to stock your freezer with these. Flavors include Asian meatball, Szechuan pork, Lemongrass curry, Pepper chicken, Sweet ginger chicken, and Braised teriyaki.